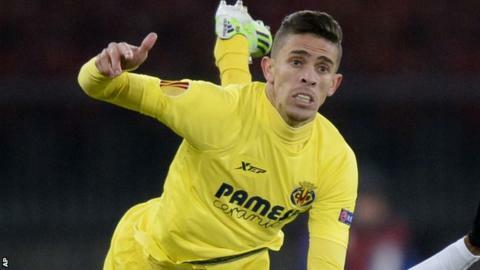 Arsenal boss Arsene Wenger says the club are in talks with Villarreal in a bid to sign defender Gabriel Paulista. "The talks are progressing quite well," he said. "Can we find an agreement or not I don't know. We are slowly progressing and there is a chance." The Gunners are likely to have to secure a work permit for the uncapped 24-year-old Brazilian. Arsenal signed 17-year-old defender Krystian Bielik from Legia Warsaw for a reported £2.4m this week. Wenger said Bielik, who can play in central defence, would be used as a defensive midfielder "without any question". Regarding Bielik's fitness, he said: "He's not fit because they had the long winter break in Poland so he's at the start of getting back to full fitness and will not be ready for three weeks." Wenger said there was a "50-50" chance that Paulista, the £15m-rated defender who joined Villarreal from Brazilian side Vitoria in 2013, would join him and added: "We are ready to pay the price we think right for a good player." But because Paulista is not a European Union citizen and has yet to establish himself as a senior Brazil international, he would not meet the automatic work permit criteria. Arsenal would have to convince a Football Association hearing that the defender was an "exceptional talent" and so should be granted permission to work in the United Kingdom. That recommendation would then be passed on to the government department for a final ruling. Wenger said that Hector Bellerin should be available for Saturday's FA Cup tie at Brighton following ankle trouble, but midfielder Alex Oxlade-Chamberlain (groin) is a doubt. The Arsenal manager also said that England striker Danny Welbeck "will need two more games to be back again" and is not in full training yet.